Total Dhamaal Song Speaker Phat Jaaye: Anil Kapoor And Madhuri Dixit's Evergreen Chemistry Steals The Show In This Fun Track! 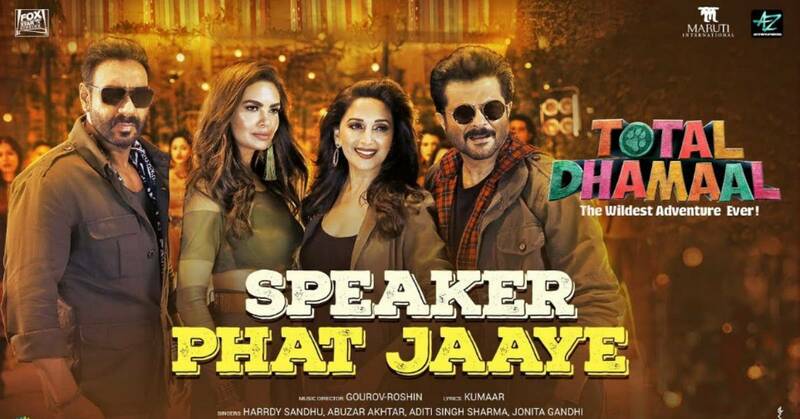 The makers of the film Total Dhamaal have released another track from the film titled Speaker Phat Jaaye which starts from the quirky lines which says O Meri Lady Gaga, Dil Tere Peeche Bhaaga and that itself makes the track a promising fun number right from the beginning. We see Anil Kapoor and Madhuri Dixit along with Ajay Devgn and Esha Gupta heat up the dance floor. The track also features the other ensemble cast members like Arshad Warsi, Riteish Deshmukh, Sanjay Mishra and Javed Jaffrey, among others shaking a leg. The peppy song is based on the theme of the jungle and it is quite evident from the costume of the lead actors who are wearing attires with shades of green and brown. The song is sung by Jonita Gandhi, Aditi Singh Sharma, Harry Sandhu and Abuzar Akhtar while the lyrics are penned by Kumaar and the song is composed by Gourov Roshin. The cast of the film are currently on a promotional spree with the release date nearing. The makers have already released two tracks, Paisa Yeh Paisa and Mungda earlier which has struck a chord with the masses. The makers have also planned to release the spoofs of the trailer of the film in different languages with the Punjabi version already out. The film will be releasing on February 22nd, 2019.